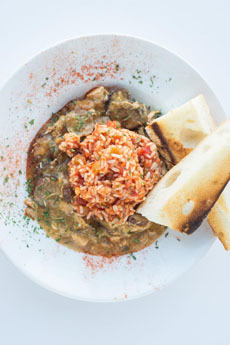 If you can’t decide between gumbo or jambalaya for Mardi Gras (this year on March 4th), go for gumbalaya, a combination of both. Gumbo is a Cajun stew that typically consists of a strongly meat or shellfish stock, the Cajun “trinity” (bell peppers and onions), and a variety of proteins such as andouille sausage, chicken and shrimp, served with rice. Okra is often used as a thickener. The name is believed to derive from the Bantu word for okra, ki ngombo. Jambalaya, a rice dish related to paella, is Cajun by way of the Caribbean Islands. The Spanish residents mixed native ingredients with stock and rice. The Atakapa tribe of the Southeastern U.S. contributed the name: The phrase “Sham, pal ha! Ya!” means “Be full, not skinny! Eat Up!,” the equivalent of “Bon appétit!” Here’s a recipe. After the widespread popularity of the cronut, Chef Mike Valentine of Ford’s Oyster House in Greenville, South Carolina thought it would be fun to create a mash-up of the two Cajun classics. A classic Louisiana gumbo. Photo courtesy MackenzieLtd.com. *You can buy or make your own Creole seasoning. Here’s Emeril Lagasse’s version, which makes about 2/3 cup: Thoroughly blend 2-1/2 tablespoons paprika, 2 tablespoons salt, 2 tablespoons garlic powder, 1 tablespoon freshly ground black pepper, 1 tablespoon onion powder, 1 tablespoon cayenne, 1 tablespoon dried oregano and 1 tablespoon dried thyme. Store in an airtight container away from light. Use within three months. 1. PREHEAT oven to 350°F. Place chicken in a roasting pan and cook for 20 minutes. Let it stand for five minutes after taking it out of the oven, then cut into half inch pieces. 2. COOK andouille sausage in the oven for 8 minutes at 350°F. Let it stand for 5 minutes. 3. PLACE butter and flour in large saucepan. Turn on medium heat and cook while stirring constantly, until it becomes a light chocolate color. ADD green peppers, celery, onion, chicken, andouille sausage and bay leaves. 4. ADD chicken stock, stirring constantly so the roux fully incorporates with the stock. 5. ADD black pepper, cayenne pepper, Creole seasoning, hot sauce, oregano and thyme. Let the gumbo cook for 15 minutes. Add salt as needed. †FOOD TRIVIA: Andouille, pronounced on-DWEE, is a spicy smoked sausage made with pork and garlic. The word is French, from the Old French andoille. Andoille dervies from the Medieval Latin inductilia, things to be introduced, from the Latin inductus, past participle of indUcere, “to introduce into a casing.” Whew! 1. PLACE olive oil in a medium saucepan. Add celery, onion and bell pepper and cook for 5-6 minutes. 2. ADD garlic, fresh thyme, oregano, cayenne, Creole seasoning, crushed red pepper flakes and hot sauce. Lastly, add the marinara sauce and simmer for 10 minutes. Salt to taste. 3. ADD cooked rice to jambalaya sauce; combine thoroughly. 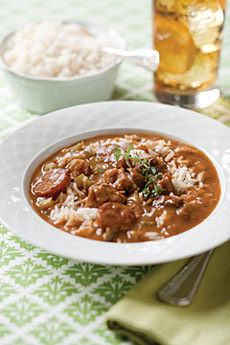 SERVE Serve gumbo in bowl with a heaping scoop of jambalaya/rice mixture and a side of toasted French bread. Option: Garnish with a sprinkle of cayenne and thyme (see photo).